Happy New Year, my dears! Yesterday I wrote about some of my favorite moments of 2013, which was absolutely fantastic to reflect upon. I think being at the age where I'm old enough to really remember what happened during the year is incredible, and I hate it when people say "Oh, 2013 was a bad year." The same goes for having a bad month, week, or whatever. Sure, bad things happen, but there's always something in your day that can make it a good day! It's all about attitude-- how are you going to choose to think about this day? Anyway, I know people out there are saying that they won't make resolutions because they always break them, but I love setting goals. The word 'resolutions' actually means "a firm decision to do or not do something". How weird and strict is that?! I mean, I could say that my resolution is to be healthy, but how is that a firm decision? That's why I'm all about goals. A goal is "an object of a person's ambition or effort; an aim or desired result". Goals are what we should really be basing our efforts on, because they can be set high or low and..... you're allowed to fail at them. At Awesome Inc, they have this 'Fail Friday' where they set really big goals and go after them. They set high standards and do everything in their power to get that high, out there goal. And if you don't get it, no biggie. It goes on the Failure Dashboard where everyone learns from it. It's taking this definition of a goal and the efforts to get there with the intention of your "ambition or effort". You set your goals: again, your desired result is your goal. Then you figure out your strategies for each goal: in which way are you going to go at your goal? What's your plan for it? Then your tactics: what are you specifically going to do? This is the more straightforward thing that you are actually going to achieve. Goals are also made to be upped every so often. 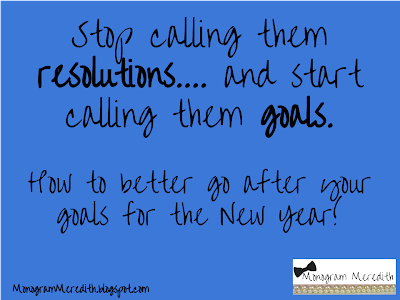 Resolutions are broken so frequently because it's impossible to set a high standard for the whole year... it's okay to set baby goals in order to achieve your main goal! I've written out my goals for 2014 (they're more of just second semester of this year...who knows what college will have in store?!) and some of the things I'm going to do to achieve them. Now, I know not everyone wants to read these sorts of things, but it's a system of accountability. When you share your goals with someone else (or the Internet...), you feel a better sense of accountability and that you can actually be held to them. And yeah, so what if I fail? It's the effort that will help you inevitably get better at your intended goal. That also goes hand in hand with another way to be held accountable: writing them down. I'm writing them on this blog, but I had a friend who said that she wrote hers down on a big poster board and hung it up in her room so that when she woke up every morning, she remembered them. I think it's absolutely incredible and I'm going to be doing it as well! Another thing you could try is a vision board. I first thought of it when they talked about it on 2 Broke Girls and I love the idea. They can be so pretty and inspirational! You can see a lot of photos of them on Pinterest as well. So here are some of my goals, with a few examples of my strategies and tactics. I hope that after this month, some of the metrics will be changed (ie, cardio six days a week). Also, sometimes strategies and tactics can overlap, so don't worry too much about that. Less dairy products and refined sugars, more raw foods. Pack a 'good' lunch a couple days a week- not peanut butter and jelly every day. Some sort of cardio four days a week. Class at the Y at least once a week to keep interest. Clean papers out of my notebooks everyday. Keep my car clean by picking up stuff everyday. Less water bottles in my car. Work at my desk, not bed. Make sure my desk is clean when I get home from school. Keep snacks in my car. On the same hand, spend money on pieces that I value and really want. Put aside savings for bigger purchases. Find the best prices for big purchase and save 1/3 of all money I make. Not sit on phone late at night and read for 30 minutes before I go to sleep. Make sure I always have a book. Schedule blog posts ahead of time more efficiently. Set metrics and specific goals. But, I have a full, written out list that I'm going to be keeping in my planner and in my room, and I'm going to make sure that I have someone to keep me accountable, like my sister. She wanted to be healthier this year as well, so she gave up soda. I know that and she knows of my goals, so we're helping each other with them! Even if you don't have the same goals as someone else, the other most likely knows of what you want and can remind you of why you're doing what you're doing. Now, I know people get sick of things that urge you to change and the saying 'New year, new me' is redundant. But I think that only good can come from efficient goal setting! I hope to have a post at the end of January about my goals! So, what are your goals for the new year? Want to join along? Comment or email me yours and we'll stay in touch (it's like having a workout buddy!). I always fail at the planning stage, so I love the idea of GST! Happy New Year and here's to accomplishing all of our goals this year!